ALWAYS READ AND FOLLOW PESTICIDE LABEL DIRECTIONS. Roundup Ready® crops contain genes that confer tolerance to glyphosate. Glyphosate herbicides will kill crops that are not tolerant to glyphosate. 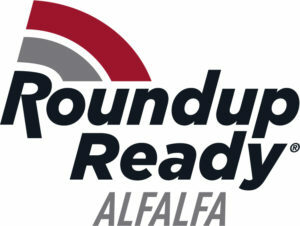 Roundup Ready® is registered trademarks of Monsanto Technology LLC, used under license by Forage Genetics International, LLC. Allegiance® FL Seed Treatment Fungicide provides systemic protection for the seed, roots and emerging plants against devastating diseases such as Pythium, systemic downy mildew and Phytophthora. It provides protection for early-planted crops and helps produce healthier, more vigorous and uniform stands. Allegiance® is applied at very low rates per acre, making it friendly to the grower, seed and the environment. Ratings are based on the average performance of the variety over a wide range of climate and soil types. Actual performance may be adversely affected by extreme conditions. Unless stated, ratings are based on standardized testing procedures endorsed by the North American Alfalfa Improvement Conference. FALL DORMANCY: The reaction of alfalfa varieties to decreasing day length and temperatures in the fall versus check varieties. FD 1 Norseman, FD 2 Vernal, FD 3 Ranger, FD 4 Saranac, FD 5 Archer, etc. PEST RESISTANCE RATINGS: S = Susceptible with 0-5% resistant plants; LR = Low Resistance with 6-14% resistant plants; MR = Moderate Resistance with 15-30% resistant plants; R = Resistance with 31-50% resistant plants; and HR = High Resistance with greater than 50% resistant plants. WISCONSIN DISEASE RATING INDEX: For the six major diseases of alfalfa, a variety is awarded 5 points for each HR, 4 points for each R, 3 points for each MR, 2 points for each LR and 1 point for each S. A perfect score is 30 of 30. WINTER HARDINESS INDEX: 1 = Most hardy and least winter injury, 6 = Least hardy and injury resulting in plant death. Ratings are in relationship to the winter injury incurred by standard check varieties.